This cute squirrel shirt shows the rodent stuffing his mouth with birdseed. 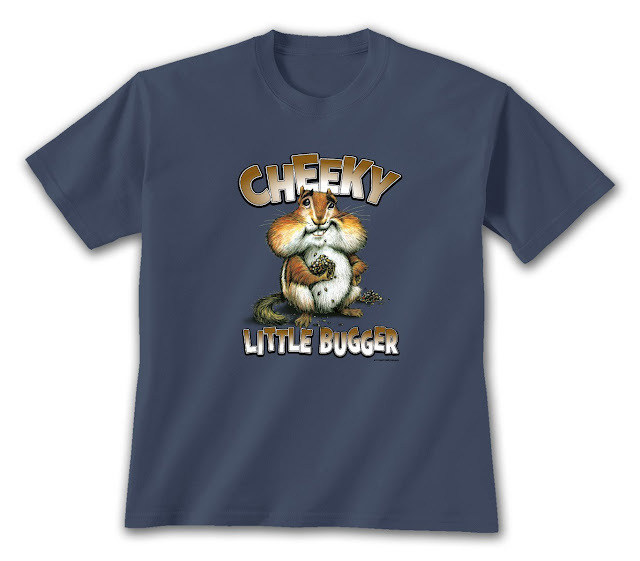 It reads: "Cheeky Little Bugger." Available in kids' sizes and generic adult sizes. This funny squirrel has all it needs: gumption, sass, and pocket cheeks. Man, don't you wish you had pocket cheeks? The main drawback is that it doesn't come in "girly fit" sizes. But other than that, it's an excellent design! One thing I dislike about this design is the little attribution footer at the bottom of the design, which is probably a link to some website. In my mind, the advertising is the shirt itself. If you include a link or company name on the shirt, the the shirt should be free (because you're effectively turning the buyer into a walking billboard, so you should be paying them at least the cost of a shirt for advertising). Still, in this case, the attribution is small and fairly inconspicuous. And that squirrel is darn cute.